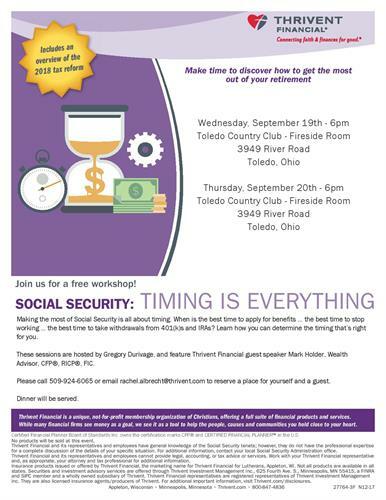 Making the most of Social Security is all about timing. When is the best time to apply for benefits … the best time to stop working … the best time to take withdrawals from 401(k)s and IRAs? Learn how you can determine the timing that’s right for you. These sessions are hosted by Gregory Durivage, and feature Thrivent Financial guest speaker Mark Holder, Wealth Advisor, CFP®, RICP®, FIC. Please call 509-924-6065 or email rachel.albrecht@thrivent.com to reserve a place for yourself and a guest.